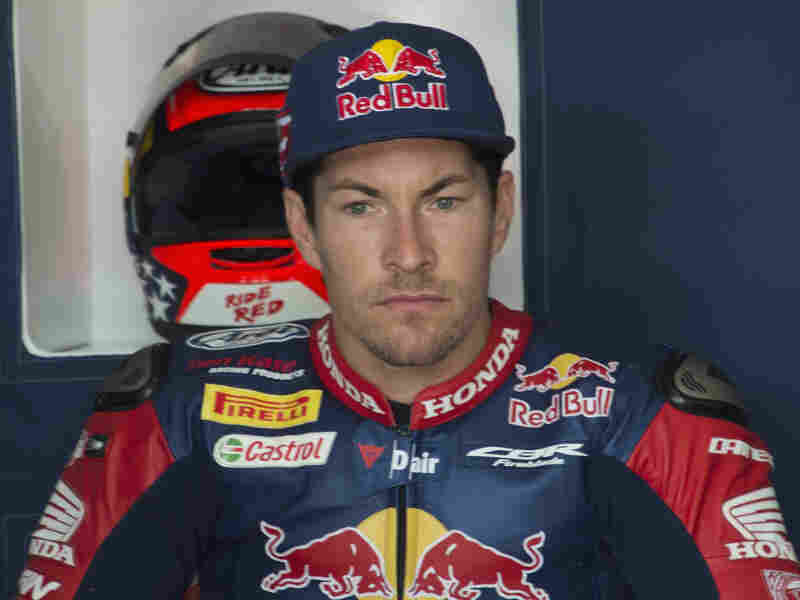 Nicky Hayden, Champion Motorcyclist, Killed In Italy : The Two-Way Hayden was riding a bicycle on the Rimini coast when he was hit by a car, suffering traumatic head and chest injuries. Motorcycle champion Nicky Hayden on May 12 in Misano Adriatico, Italy. Hayden died Monday after being hit by a car while bicycling. Nicky Hayden, a champion motorcycle racer, died at an Italian hospital Monday, five days after being struck by a car while bicycling as part of his training on the Rimini coast. The 35-year-old had suffered trauma to his head, chest and abdomen after colliding with the car's windshield, leaving him in critical condition at Maurizio Bufalino Hospital in Cesena. The hospital confirmed Monday that he died "following a very serious polytrauma." At the time of his death, Hayden's mother and fiancee were by his side, according to a statement by the Red Bull Honda World Superbike Team. "Although this is obviously a sad time, we would like everyone to remember Nicky at his happiest – riding a motorcycle," his brother Tommy Hayden — also a motorcycle racer — said in the statement. Nicky Hayden was in Italy after competing in the Superbike World Championship races at Imola on May 14. Judicial authorities have opened an investigation into the crash and have questioned the 30-year-old driver of the black Peugot that hit Hayden, reports The Associated Press. Born in Owensboro, Ky., to parents who both raced dirt track, Hayden, dubbed the Kentucky Kid, began racing professionally at age 16 — as soon as he became eligible. He began MotoGP racing in 2003 and was crowned the MotoGP World Champion three years later. This season, he was ranked 13th in Superbike, racing for the Red Bull Honda team. The Washington Post reports, Hayden's is the latest in a series of high-profile collisions between cars and bicycles in Europe. Last month an Italian pro bicyclist was killed during training after a van crashed into him in Italy. And on May 9, Tour de France winner Chris Froome tweeted that he was "rammed on purpose," while cycling in France. Froome said his bike wound up crumpled, but he was okay. Hayden's brother says the family hopes to have the body returned home soon.